A collection of Christmas standards, featuring a 17- piece big band recorded live with vocalists Derek Hines, Joni NehRita and Randy Lyght. The Big Band Theory had its genesis in Kitchener-Waterloo, Ontario in October, 2011 when seventeen of Kitchener-Waterloo Region’s (and some from beyond) talented jazzers showed up for that first rehearsal. since then, BBT has developed a deep repertoire of period music from the swing era (Benny Goodman and Count Basie), contemporary big band arrangements (LA's Big Phat Band), and 70s horn bands (Earth, Wind and Fire, Tower of Power). As Ken Hadley, lead alto player says: “This band will part your hair!”. KW Big Band Theory now has two recordings under their belt. The first was called "Evidence" and featured Canadian jazz icon Don Thompson on vibraphone. The album was made possible from a grant from the Waterloo Region Arts Fund and featured original compositions and arrangements by members and friends of the band. This, their second recording project is a live recording of Christmas music done at the Registry Theatre, Kitchener. Both recordings were produced by Juno award-winning engineer Rick Hutt of Cedartree Recording Studio. 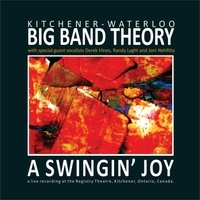 KW Big Band Theory greatly appreciates the ongoing support of The Grand River Jazz Society, The Jazz Room, Lawrence McNaught at the Registry Theatre, the Ellingham family, and all of the loyal supporters of big band music in the Waterloo Region.